Review originally written for the Doha Film Institute website. The ninth Dubai International Film Festival (DIFF) opened with the MENApremiere of Ang Lee’s highly anticipated ‘Life of Pi’ with various members of the talented cast in attendance. ‘What do you see?’ is the campaign tagline for DIFF this year, with artwork inspired by the Rorschach inkblot test – a type of personality test used to analyse emotional functioning. DIFF developed the clever approach with Dr. Raymond H. Hamden, a clinical and forensic psychologist, and the staff of the Human Relations Institute in Dubai. Guests receive several inkblot images matched to various films in the festival, and a test chart that helps them decide which films to watch according to their psychological traits. The festival opened yesterday with a ceremony directed by Mohammed Saeed Harib, the creator of Freej, which transported the audience into a hypnotic journey of visual bedazzlement, always around the magic of film. 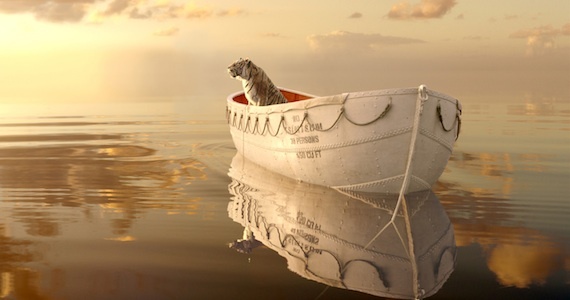 The choice to open the festival with ‘Life of Pi’ also follows the theme of individual perspective and unique personal viewpoint. Adapted from Yann Martel’s internationally best-selling novel of the same title and made by visionary director Lee, the film follows the journey of young Pi Patel (Suraj Sharma) in his battle of survival on a tiny boat lost at sea – where his only companion happens to be a Bengal Tiger. The story begins when a writer (Rafe Spall) who is looking for inspiration visits Pi (Irrfan Khan) to hear about his fantastic tale and brave adventure ‘that will make you believe in God’. Pi revisits his childhood in India taking care of zoo animals with his father, until the day his family decides to move to Canada. An epic storm sinks the ship and Pi finds himself alone on a lifeboat with the hungry carnivore. He manages to build a raft in order to maintain a safe distance from the animal.The relationship between the two becomes the narrative core; in the middle of nowhere, all they have is one another. Assisted by by 3D technology, Lee’s film transcends the instinct of survival theme, becoming an enchanting portrait of visual poetry and one of the best examples of stunning visual effects I’ve seen. Everything portrayed is contained within a very specific idea of Pi’s perception; for example, reflections on water make swimming seem like flying among the clouds. Recurrent mirror effects provide a spiritual dimension to the journey. It’s a dreamlike vision of very harsh conditions, where the raging of nature is viewed as a rare work of art – favourite examples of sheer aesthetic beauty are a sequence in which flying fish miraculously fill the lifeboat just as the food has run out, and the harsh majesty of a life-threatening storm. The cinematography shifts away from the realistic via an exaggeration of the colour palette, which only heightens the magic of the picture. Being absorbed by the illustrations – in many ways, the film looks like a picturebook – some anticipated emotion is drowned along the way. The film’s supremacy is in its personalised reading of a philosophy of life rather than on the feelings it projects. A strongly recommended trip for those who dream in colour. If you have seen the film, we’d like to know: What did you see?